Promoting urine glucose excretion (UGE) is an attractive approach for the treatment of diabetes. Obesity is associated with increased risk for type 2 diabetes. This study was aimed to investigate the association of waist-to-hip ratio (WHR), a simple measure of abdominal obesity, with UGE determined in subjects without previous history of diabetes. We studied the correlation of WHR with UGE in 7485 participants without previous history of diabetes. All participants were given a standard 75 g glucose solution. Clinical parameters and demographic characteristics were assessed. Multiple linear regression analysis and multivariate logistic regression analysis were performed to determine the association of WHR with UGE. Individuals with high WHR (H-WHR) exhibited significantly lower UGE compared to those with low WHR (L-WHR), in either normal glucose tolerance group or pre-diabetes group. In newly diagnosed diabetes group, individuals with H-WHR also showed lower UGE than those with L-WHR; however, no statistical significance was observed. After adjustment for potential confounding factors, including age, genders, and blood glucose level, WHR was negatively associated with UGE (β = −250.901, 95% CI: −471.891 to −29.911, p = 0.026). However, no significant association was observed between BMI and UGE. Furthermore, multivariable logistic regression model showed that individuals with H-WHR were more likely to have low UGE (OR = 0.83, 95% CI: 0.71–0.97, p = 0.018). Individuals with H-WHR were at risk for decreased UGE. 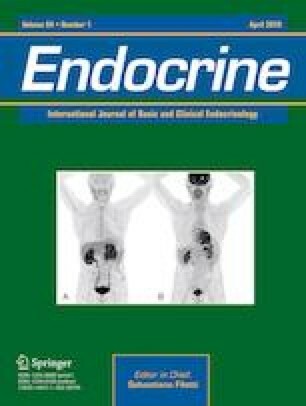 This study suggests that WHR, but not BMI, might be an important determinant of UGE. This study was supported by grants from the Excellence Project of Southeast University, the National Key R&D Program of China (2016YFC1305700) and the National Key Scientific Instrument and Equipment Development Project of China (No. 51627808). The funders had no roles in study design, data collection, data analysis, interpretation or writing the manuscript. All procedures performed in studies involving human participants were in accordance with the ethical standards of the institutional and/or national research committee and with the 1964 Helsinki declaration and its later amendments or comparable ethical standards. This study was approved by the ethical review committee of Jiangsu Provincial Center for Disease Control and Prevention (JSJK2016-B003-03).